Connect with Global Women Leaders and Become a TechWomen Cultural Mentor! #ELoftheDay – Learn about the 2014 Emerging Leaders! 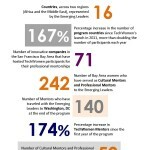 Become a TechWomen Cultural Mentor!